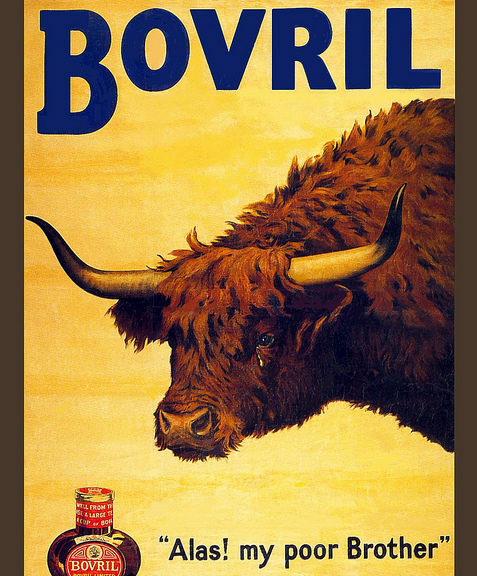 Bovril is a beef extract made from boiled cow carcasses with added flavouring. It is consumed as a hot beverage or used as a substitute for stock in recipes. John Lawson Johnston (1839 – 1900) was an Edinburgh butcher with an interest in military and medical provisions. He developed a beef broth in the 1860s that he called Johnston’s Fluid Beef. He won a three-year contract to supply one million tin cans of Fluid Beef to the French army in 1874. In order to be closer to his source of beef, he established operations in Canada. In order to lower distribution costs, Johnston began to produce a concentrated version from 1875 which he named Bovril. The name came to him as he smoked a cigar, combining the Latin “bo” meaning ox with “vril”, the mysterious life-force in the novelist Edward Bulwer-Lytton’s The Coming Race (1871). After his Canadian operations were destroyed by fire in 1884, Johnston established premises at Trinity Square, London. 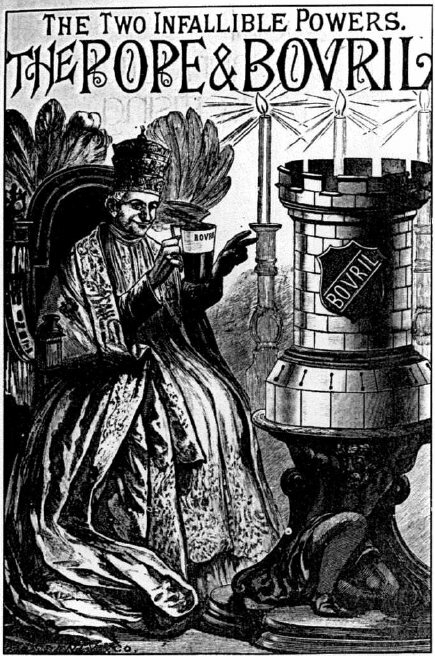 Bovril was launched in Britain in 1886. Within two years it was distributed in 3,000 pubs and shops. The classic bulbous brown Bovril bottles were introduced in 1888. The Bovril company was formed with capital of £150,000 and a new factory at Old Street, London in 1889. Bovril was one of the first consumer goods to be advertised on a massive scale. Advertising focused on its healthful properties. 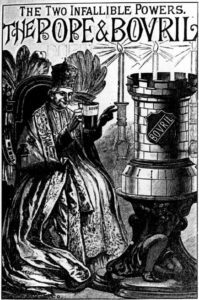 Pope Leo XIII (1810 – 1903) endorsed the product in advertisements, as he did for coca wine (a predecessor of Coca-Cola). 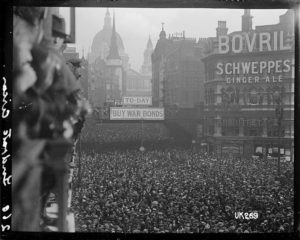 An electric sign advertising Bovril was erected at Ludgate Circus, London from 1892. The lightweight and nutritious properties of Bovril led to it being taken on expeditions by the likes of Robert Falcon Scott and Ernest Shackleton. Edmund Hillary took it to the Everest Expedition. 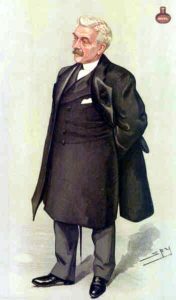 Bovril was sold to the financier E T Hooley (1842 – 1903) for £2 million in 1896. Privately, Johnston had believed even £1.5 million to be a ridiculous price to pay for the company. Hooley floated the company later the same month for £2.5 million. However he stripped the company of its working capital, and promised higher dividends than the company could afford. Hooley walked away with his profit, but Johnston, who remained as chairman, was forced to loan the company £150,000 just to keep it afloat. Bovril was available in over 100,000 retail establishments in the UK, as well as most hospitals and infirmaries, by 1896. Virol malt tonic was introduced from 1889, soon followed by Stelna corned beef. Following the death of his father in 1900, George Lawson Johnston (1873 – 1943) became the chairman of Bovril. 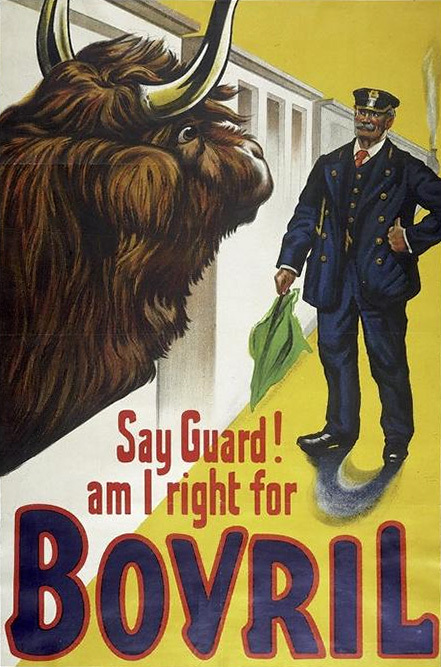 Bovril was ranked 35th largest among British companies as measured by share capital in 1905. Bovril was made from a 100 percent beef recipe. It was made from finely granulated dried beef powder imported from Canada. It differed from rival beef teas in that it contained bovine blood as a thickening agent. The factory was hailed as the cleanest in London, and the company regularly invited doctors and chemists to inspect it. After Bovril’s principal meat supplier entered into an exclusive contract with Liebig’s, its main rival, from 1906, Bovril acquired half a million acres of land in Argentina to ensure a supply of beef from 1908. It also acquired beef from Australia and New Zealand. Bovril acquired Marmite of Burton-upon-Trent and Ambrosia, a Devon-based producer of milk-based desserts, in 1924. The Old Street factory was capable of producing 57,600 bottles of Bovril every day by 1927. 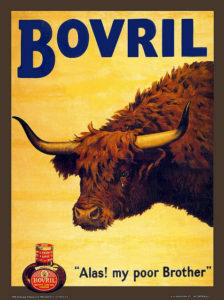 Bovril, with 310,000 cattle, had the largest herd under single ownership in Argentina by 1930. Bovril had a market value of £10.8 million by 1930, making it the 23rd most highly valued company in Britain. Stelna had been rebranded as Bovril corned beef by 1936. Sadly, many of the company records were destroyed during the Second World War. The Old Street factory was hit three times during the Blitz, but only a total of four working days were lost. The Argentine estates covered over one million acres with over 200,000 cattle by 1959. The cattle were descended from Bovril-bred pedigree bulls from Ampthill in Bedfordshire. The Santa Elena abattoir employed 3,000 skilled workers, and was one of the most modern factories in Argentina. Bovril, Ambrosia creamed rice and Bovril corned beef were all market leaders in Britain by 1957. The Old Street factory broke a new record when 131,868 bottles of Bovril were produced in a single day in 1961. Bovril instant beef stock was launched in 1966. The Ambrosia purchase brought with it dairies, and Bovril processed 42 million gallons of milk in 1966. Production of Bovril was relocated from Old Street to Burton-upon-Trent, in the English Midlands, from 1967. Bovril was acquired by Cavenham Foods for £14.5 million in 1971. Bovril’s dairy interests, including three dairies in Devon and two in Ireland, were sold six weeks later to Grand Metropolitan for £6.3 million. The Bovril Argentinian interests were divested for £3 million in 1973. Cavenham invested heavily in marketing for the neglected Ambrosia brand. Cavenham had the tenth highest turnover of any British company by 1976. Bovril (including Marmite and Ambrosia) was sold to Beecham, a drugs and consumer goods company, for £42 million in 1980. At this stage Bovril employed 1,400 people in Britain, across sites in Burton-upon-Trent and Devon. Net assets were valued at around £18 million. What was by now called SmithKline Beecham sold Bovril (including Marmite and Ambrosia) to CPC, an American foods giant which owned Hellman’s mayonnaise and Knorr, for £157 million in cash in 1990. The number of employees had halved to 700 since 1980. Five million jars of Bovril were sold in 1998. CPC (now renamed Best Foods) was merged with Van den Bergh Foods, to bring Bovril into the Unilever stable from 2001. Unilever sold Ambrosia to Premier Foods for £105 million in 2003. In the wake of an European Community ban on the export of British beef, Unilever changed the composition of Bovril from beef stock to yeast extract from 2004. The ban was lifted in 2006, and Bovril began to be made from beef again. 3.5 million jars of Bovril were consumed in Britain in 2009. Bovril also has a large export market in Malaysia, Singapore and China.